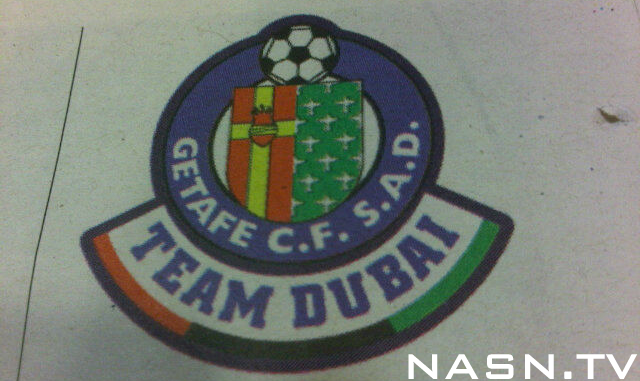 Snapshot: Getafe To Be Renamed ‘Team Dubai’ – New Badge Leaked? After a few weeks of speculation hither and thither, it was announced that the La Liga side that the Royal Emirates Group is set to fluff €90 million on was/is indeed Getafe, i.e, they of inside-out ‘Burger King’ shirt fame. Initial reports suggested that it was going to be hard-up Real Zaragoza who were going to be the subject of the Dubai buy-out, but a spokesman for the group has since confirmed that it is the Azulones who will be receiving the petro-dollar influx as well as being re-branded ‘Getafe Team Dubai’ in order to ‘deliver the message that Dubai cares’.